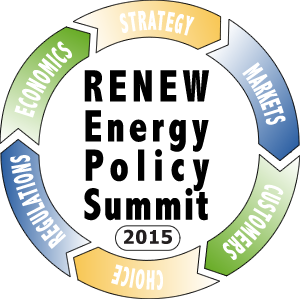 (Madison) – At its fourth annual Energy Policy Summit, RENEW Wisconsin will present awards to businesses and individuals whose achievements and vision helped lift Wisconsin’s renewable energy marketplace to new heights in 2014. Titled “Unlocking the Clean Energy Transition,” RENEW’s summit is set for January 9, 2015, and will take place at UW-Madison’s Union South. “We at RENEW are honored to have the opportunity to work closely with these award winners and take inspiration from their ongoing commitment to advancing clean energy here,” Huebner said. A list of award categories and recipients appears below. Energy Independent Enterprise of the Year – Gundersen Health System, La Crosse – For becoming the first large health care network in the nation to offset 100% of its electricity usage with its own sources of clean energy. Renewable Energy Business of the Year – Eland Electric Corporation, Green Bay - For planning and building in 2014 nearly one megawatt of rooftop solar generation in the Fox Valley/Northeast Wisconsin region. Renewable Energy Champion of the Year – Matt Neumann, SunVest Solar, Pewaukee – For outstanding public advocacy on behalf of regulatory policies and reforms that would allow renewable energy contractors to provide mainstream financing options for their customers. Renewable Energy Grassroots Activists of the Year – Steve and Ellen Terwilliger, Eau Claire - For organizing and co-hosting, along with Chippewa Valley Technical College, the Solar Power Wisconsin Affordable Energy Conference, a new outreach event that attracted nearly 200 people to Eau Claire in November 2014 to learn more about solar energy.